To see an article I wrote and has been printed in Agenda magazine in Finland and came online with Ovi magazine be stolen from a blog which copycats Ovi magazine should make me angry especially when the untalented blogger uses a series of my articles and cartoons to excuse his miserable existence. But then the only thing I feel is sorry. How untalented and miserable this person can be, how no life creature to get so low is a wander. Of course I’m going to get legal action and regarding his copycat to my cancer article I can wish him only one thing, never happen to him, and never have to go through this adventure and the same time having to deal with parasites like himself. 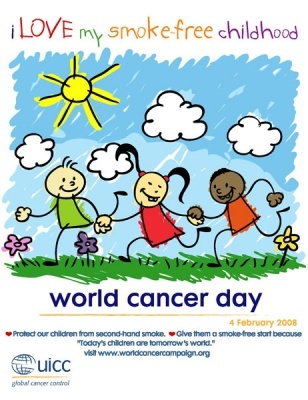 If I’d written about World Cancer Day a few years ago it would have been quite different from my thoughts today and I would have definitely focused more upon the stats and the warnings. I would definitely have overlooked the human part, but now I know better because I was diagnosed with cancer. There were all the warnings by the book, but I always had something else to do than checking with a doctor; a favourite excuse is too busy… no time at the moment. It took twelve hours in real pain, an ambulance and twenty-four hours in the emergency room of a hospital to face my new situation – be careful, I said face my situation not deal with it. What followed is pretty predictable; I left myself in the hands and the knowledge of the doctors. My generation grew up in the times when nobody ever said the word ‘cancer’, when somebody died from cancer it was “it hit him/her” or it was “that” and that “that” was taking mythic dimensions; it was the darkest side of evil itself and if “that” found you there was no way out, no escape from death. I have a very vivid memory from my early youth when a neighbour woman was hit by “that”. When she was out on her balcony everybody was taking this characteristically sad face, pointing at her and saying quietly, “Poor girl, who knows for how long “that” will let her live” – the poor woman soon died leaving behind two young children, something that made “that” even more hateful in my neighbourhood. However, I now live in the early 21st century and, as I mentioned before, I have great faith in science, especially medical science. Doctors and medications, over the last few decades, have found their way through cancer and they make miracles, especially in the early stages of cancer treatment, such as mine; it is also good that doctors take care to inform the public of their new discoveries. I have to admit from the very beginning of my adventure I felt safe and somehow reassured and comfortable. At the same time my wife and I have no superstitions, so we felt it proper not to hide my situation from family and friends, talk openly about it in a sense to adjure “that” and we did so from the very beginning. This helped me to start dealing with it. A few days after my departure from hospital and having set the first series of tests and preparations for the first treatments in motion we had an early evening dinner with very close friends and, as usual, my three-year-old daughter monopolized our entertainment. During dinner and afterwards I had the feeling that something was not right, something was missing, but it wasn’t until our friends left that I had the chance to rethink about what had happened. This was the first of a series of similar incidents. Part of the ceremony when friends come to dinner is sharing news about friends and family, and the news is not always good. There is a variety between good and bad, and sometimes it can be …spicy; well, that evening the whole world was a happy clean world with everybody living as though in a fairytale. Suddenly I realized that “that” had invaded my life uninvited via the back door. For weeks and months, even at this very minute, everybody we meet avoids talking to me about anything that would bring bad thoughts, including illnesses, accidents or any kind of negative news ignoring that it would make me more suspicious about what is going on around me and sometimes makes me wonder if I am delusional about my situation: I mean, I look worse than I feel. On top of that, living abroad and far from close family and friends made things worse; I always keep in touch with my family and friends through mail or telephone, yet after my diagnosis it seemed that these occasional monthly telephone calls became nearly daily with me spending most of my time on the phone talking about the good weather and how wonderful everything is. Suddenly, despite all the effort from family and friends, I started getting depressed, distant and isolated. In their huge effort to cheer me up they had managed to isolate me from real life, put me away in a clean place where nothing is wrong and everybody is healthy and happy, while every day I still had to be with doctors and other patients at different stages of cancer, giving a fight for my life – how ironic and schizophrenic. They had missed the point, what I really needed was to feel that in my every day life everything is as usual and life goes on. Cancer is like a war with many battles, both small and big, even some side battles that have nothing to do with cancer itself. I have won most of these battles and the war is not over yet, but I’m sure I’m winning. The best ally in this battle is good psychology and the will to win; this comes by feeling that the world around you hasn’t changed and that every day life hasn’t isolated you placing you inside a safe plastic bubble. While I should totally focus on my battle I spent too much time thinking about what is really going on and all because suddenly everybody around me saw “that” and they tried hard to hide it from me. February 4th is World Cancer Day and there are over 25 million people living with cancer; year after year the number of people who die from cancer decreases, mainly because of early diagnosis and treatment in the early stages. If and when cancer comes, please remember to avoid being overprotective to the patient because, without wanting it, you isolate them and that’s the last thing they need and want. They want to feel that they are not alone and putting them in that bubble manages exactly the opposite. Give them strength by standing beside them without isolating them from their life.